^ Zaloga 2005, p. 11. ^ Werrell 1985, p. 53. ^ Vanek 1999, p. 81. ^ Lloyd & Hall 1997, p. 222.
Cooper, Michael "Mike", Meteor Age, Doncaster, UK: Mark Turner, 1997 . Crowdy, Terence "Terry", Deceiving Hitler: Double Cross and Deception in World War II, Oxford, UK: Osprey, 2008, ISBN 978-1-84603-135-9 . Irons, Roy, Hitler's Terror Weapons: The Price of Vengeance, New York: Harper Collins, 2003, ISBN 978-0-00-711263-0 . Jackson, Robert, Britain's Greatest Aircraft, Barnsley, UK: Pen & Sword, 2007, ISBN 978-1-84415-383-1 . Jones, R.V., Most Secret War: British Scientific Intelligence, 1939–1945, London: Hamish Hamilton, 1978, ISBN 978-0-241-89746-1 . Lloyd, Clement John; Hall, Richard (编), Backroom Briefings: John Curtin's War illustrated, National Library Australia: 222, 1997, ISBN 9780642106889 . Masterman, John C., The Double-Cross System in the War of 1939 to 1945, London: Avon, 1972  . Mindling, George; Bolton, Robert, US Air Force Tactical Missiles, 1949–1969, The Pioneers, Raleigh, North Carolina: Lulu.com, 2009, ISBN 978-0-557-00029-6 . Montagu, Ewen, Beyond Top Secret Ultra, New York: Coward McCann & Geoghegan, 1978, ISBN 978-0-698-10882-0 . Reuter, C., The V2 and the German, Russian and American Rocket Program, Missisagua, Ontario, Canada: German Canadian Heritage Museum, 2000, ISBN 978-1-894643-05-4 . Sharp, C. Martin; Bowyer, Michael JF, Mosquito, Somerset, UK: Crécy, 1995, ISBN 978-0-947554-41-5 . Self, Brian. Hudson, John Pilkington (1910–2007). 牛津國家人物傳記大辭典 線上版. 牛津大學出版社. January 2011. doi:10.1093/ref:odnb/99289 已忽略未知参数|separator=（建议使用|mode=） (帮助) 需要订阅或英国公共图书馆会员资格. United States Air Force Museum Guidebook, Wright-Patterson AFB, Ohio: Air Force Museum Foundation, 1975 . Werrell, Kenneth P., The Evolution of the Cruise Missile, Maxwell Air Force Base, Alabama: Air University Press, 1985 . Vanek, David, Fulfilment: Memoirs of a Criminal Court Judge, Dundurn: 81, 1999, ISBN 9781459715028 . 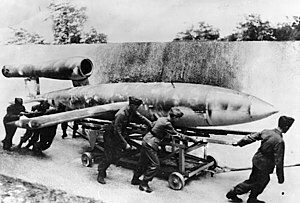 Zaloga, Steven, V-1 Flying Bomb 1942–52, Oxford, UK: Osprey Publishing, 2005, ISBN 978-1-84176-791-8 .